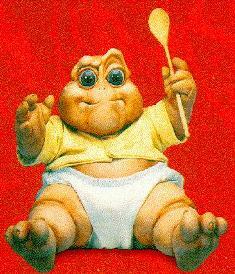 Remember this "Dinosaurs" baby whose phrase was "Not the mama?" Let's take it a step further: not the octomama. I'll smile to be polite, but your octojoke really isn't funny. I am not and will not be the freakin’ Octomama — not in a box, with a fox or eating lox. And no, I’m not even the septomama. Say it with me: Not. The. Octomama. Repeat as many times as needed to realize that any “jokes” related to Nadya Suleman aren’t funny and probably won’t be for anyone who has to undergo fertility treatments. Implanting more than the recommended number according to a potential mother’s age is like Russian roulette, not only with the chances of a live birth, but with the mother’s life. More babies, more problems (read: complications). The greater the number of embryos in utero, the greater the likelihood that one or more of them might have to take one for the team. (I offer my apologies for attempting to soften the blow of reality.) Essentially, too many kids in the tub might force parents toward the decision of which ones stay and which ones have to be aborted to prevent the death of all. That’s real talk. If multiples make it through pregnancy, the existence of many increases the risk of premature delivery. That’s days, or even, months in somebody’s NICU. It’s like a car accident. It’s one thing if it happens; if it occurs because your own recklessness, then it’s dumb. We decided on two because, like most couples, we feared the risk of transferring one and having an unsuccessful cycle. We were adequately informed concerning single-embryo transfer, or SET, an industry-wide recommendation that all it takes is one, but we opted to roll this dice anyway. Aside from that, I really would love to have twins. Boys or girls, one of each, or a set of kittens with my nose and his eyes — any combination would make me happy. As for the remaining five, we’ll literally have them on ice in case the first two don’t make it. (They’ll be frozen.) Should that happen, we’ll start again with two more. Or if we’re successful right out the gate, our frozen reserves will remain until it’s time for more children. Beyond the family size we choose, we’ll donate the rest to another couple who isn’t as fortunate as we’ve been to get to this point. OK – I am a person who will blurt out something stupid, but I would never call you that… Love you and I am KEEPING HOPE ALIVE with the Brown Egg Coalition. So excited for you guys! Praying!